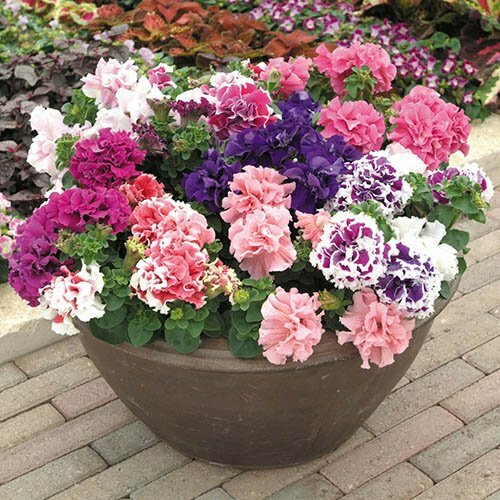 You will absolutely love these vibrant, beautiful Petunias with double Carnation-like blooms. A gorgeous range of pinks, purples, whites, reds and blues! Transform your baskets or patio. Incredibly large (up to 5 inches across!) flowers, weather-resistant, and great value. You'll absolutely love these vibrant, beautiful Petunias! With their incredible, double, Carnation-like blooms produced in wave after wave all summer long, this fantastic collection will truly bring your garden to life this summer. In a gorgeous range of pinks, purples, whites, reds and blues, your baskets and borders will be simply awash with colour! Incredibly large flowers, weather-resistant, and great value - what more could you want?! Supplied as a pack of 40 plug plants (1.2 - 2cm Diameter).